Macaron making is not a mysterious art. And it’s not subject to quite as many rules and regulations as you might think. It’s simply a question of understanding your ingredients, of knowing your oven and of practising to make perfect. Too many good blog posts have addressed this issue for me to expand on it in any depth, but if you’re new to macarons, do read Stella from Brave Tart’s brilliant – and refreshing – take on macaron making here. Whatever your attitude to macarons, if you love to bake then mastery of this sweet treat is a must. And if you want to master macarons, Adriano Zumbo is your man. If Pierre Hermé is the king of macarons, Zumbo is his bolshy younger brother and a strong contender for the crown. Living up to the Willy Wonka tattoo emblazoned across his right bicep, this incredible Sydney-based patissier approaches life like a kid in a candy shop, creating wild and wacky combinations of flavour and texture to wow, shock and confound the expectations of his audience. Crisp shell, chewy crumb & a smooth, melting centre…with added crunch! Some of his more bonkers concoctions include kalamata olive, pig’s blood and hamburger macarons (that’s three separate flavours mind, although it wouldn’t surprise me if he put them all together), alongside seasonal ranges of more traditional flavour combinations; coffee crème brûlée, raspberry shortbread and salted butter popcorn. While delighting in different tastes and textures, he also experiments with the shape of his macarons, and couple of years back produced a candy cane macaron for Gourmet Traveller magazine, shaped like a shepherd’s crook and filled with minty sweet ganache. This post is inspired by that recipe. I’d originally planned to make chocolate orange macarons for my Mactweets challenge – I always get a Clementine and a little bag of chocolate coins at the end of my stocking, so the combination is one of my ultimate festive flavours – but when out shopping last weekend I spied the cutest little box of candy canes. Their toothpaste stripes and super sweet, tooth-rotting properties immediately put me in mind of my macaron challenge (macarons are delicious, but tend to be tooth-itchingly sweet), so I promptly set about googling recipes that could incorporate my purchase. Crushing the candy to make my ganache, I was struck by how sparkly and festive the shards of sugar looked. So rather than shaping my macarons into canes, I’ve gone for a more traditional round, rolling the edges in the crushed candy for added texture and crunch. It works beautifully against the creamy white chocolate and peppermint centre, adding an extra dimension to create a crispy, chewy, sugary mouthful of macaron. I’ve also added a little cinnamon to my shells for festive flavour, and dusted the tops with some edible green glitter. The result is a super-sweet minty treat, perfect for the season’s festivities. It’s also a great way of using up leftover candy canes if you find you’ve got a glut after Christmas. Whilst finishing off my batch of macarons, I remembered a stash of chocolate coins we haven’t quite managed to get through yet. Dark chocolate and peppermint is a winning combination, so if there’s any chocolate left after our Christmas feasting (who knows, stranger things have happened), I’m going to stir some into ganache for a richer, darker, more chocolaty variation on this recipe. What flavours make you think of Christmas? What are you hoping to find at the bottom of your stocking? And do you ever have leftover chocolate, sweets and other treats after the big day? Preheat oven to 140 degrees C. Line two baking trays with baking parchment. Blitz the ground almonds and icing sugar in a blender, then sieve. Combine the caster sugar and 40ml water in a pan, stirring until the sugar dissolves, then bring to the boil and cook for 4-5 minutes. If you have a sugar thermometer (I don’t) it should reach 121 degrees C.
Meanwhile, whisk 55g of egg white with an electric mixture, gradually adding your syrup to both sides of the bowl. Whisk for a further 3 minutes until the mixture is luke warm, then stir into the almond and icing sugar mixture. Add remaining eggwhite and your pinch of cinammon, then fold carefully to combine. Slap excess air out of white mixture with a spatula. Fill a piping bag with your mixture and pipe small rounds onto your prepared trays, about the size of a two pound coin. Firmly tap the trays on the worksurface to expel excess air, then leave to rest until a skin forms and mixture doesn’t stick to your finger when touched (about an hour). Bake until firm and tops are set (10-12 minutes), then leave to cool on the trays. For the ganache, put the crushed candy canes in a pan and melt without stirring over a medium-high heat until caramelised (4-5 minutes). Warm the cream in another pan, then add to the caramelized candy canes, shaking the pan until combined. Add the chopped chocolate and peppermint essence, stir until melted, then add the butter. Pop the ganache in the fridge to firm up (about an hour). When you’re ready to assemble the macarons, fill a piping bag with your ganache. Pipe a ring of ganache onto the flat side of one macaron, then sandwich with another, allowing filling to spill slightly over the edge. 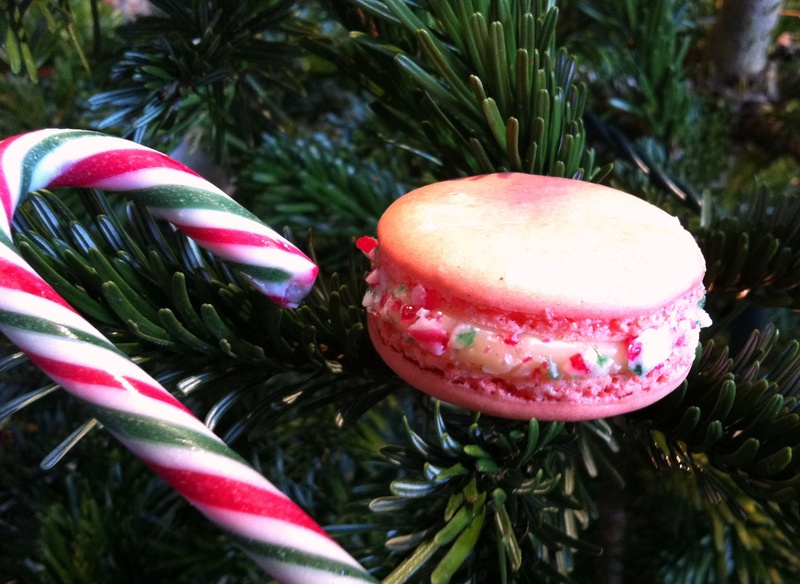 Roll your macaron in the remaining crushed candy cane to coat the outside. If you leave your macarons for one day, the flavours really develop and the contrast of crispy, chewy shell and thick, creamy ganache is gorgeous. They should last up to 2 days in an airtight container. These are stunning, wow! I have a little Christmas treat for you over at my place, come and pick it up. They are beautiful! I need to practise these (I’ve made two batches, one very good, one very bad) but have no discipline for practising! Gorgeous macarons – as ever – and a perfectly festive flavour combination! How cute! I love the candy cane around the edges. Macs are funny – they are difficult to get right (especially French – even my chefs say they sometimes have troubles) – but the process is simpler than a lot of people make out, as you say. Peppermint and gingerbread flavors always make me think of Christmas. These macarons are absolutely beautiful. I love how pretty the crushed candy cane decoration looks. They look fantastic and I bet they taste lovely too. Definitely very festive. How cute! And less stressful than a candy cane shaped one too 🙂 I’m hoping for a GHD and an iphone 4S in my stocking! These are amazing looking macarons. I love the crushed candy canes and the colour. I’ve personally never tried making them myself but will give it a go next year. There are so many flavours I’d associate with Christmas – chocolate, orange, candy canes, peppermint, cinnamon, nutmeg, cranberry, …. 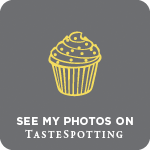 Nuts About Food – I need to have a think about who to pass the awards on to, great idea! Julia – practising can be pretty boring…only make them if you want to eat them! Lora – thank you, me too! I love how sparkly the candy cane looks. Laura – aw, you’re too kind, thank you! The Macaron Queen – thank you. 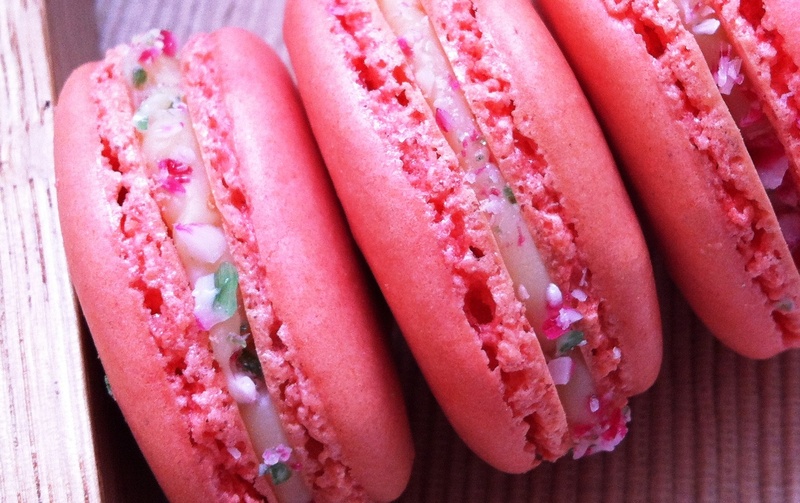 If you like peppermint, these are the macarons for you! Baking Addict – definitely have a go in the New Year, macarons can be lots of fun to make & the varieties are endless. Those colours are so fab! So Christmassy yet delicious 🙂 perfect! WOW..those are beautiful macarons! 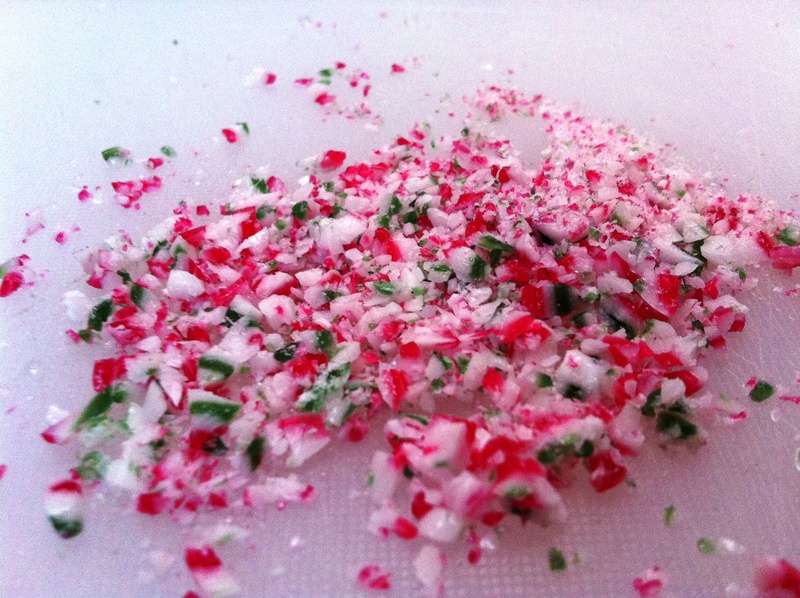 I love the shards of crushed candy canes jutting out from the sides – beckoning one to take a bite. Gorgeous shade of pink for the shellss too..so festive – love it! Wow! What a brilliant and beautiful idea for a macaron! I can’t wait to taste some 😛 I’m a failure at making my own, and I only buy them now! Lovely photographs and very tempting looking macaroons. I love macaroons, but it’s the point you made about practise makes perfect which puts me off making them!!! I get an orange, apple and nuts at the bottom of my stocking but I always add chocolate coins to any I’m giving – which is two this year. I always hope I will get enough goodies to keep me going through the festive period, but usually end up having to buy them myself! Hope you have a very Merry Christmas with lots of chocolate coins to keep you going. 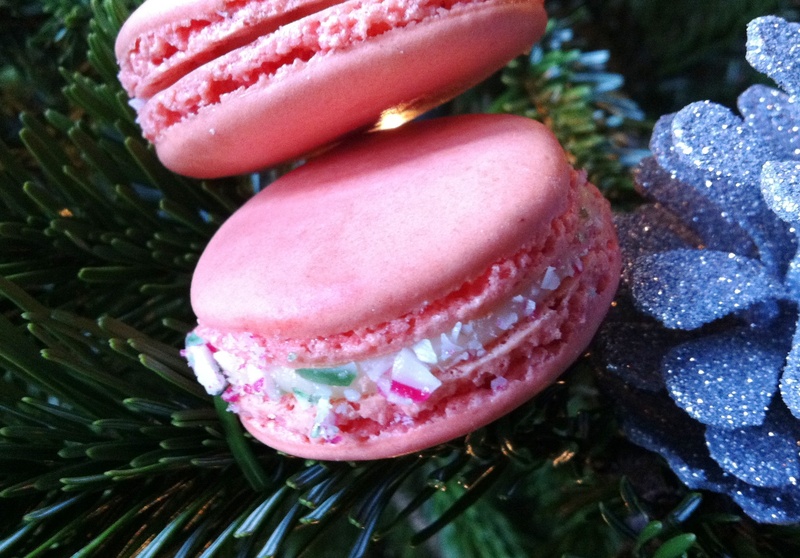 What a great idea having crushed candy canes filling these beautiful macaroons. They look so festive! 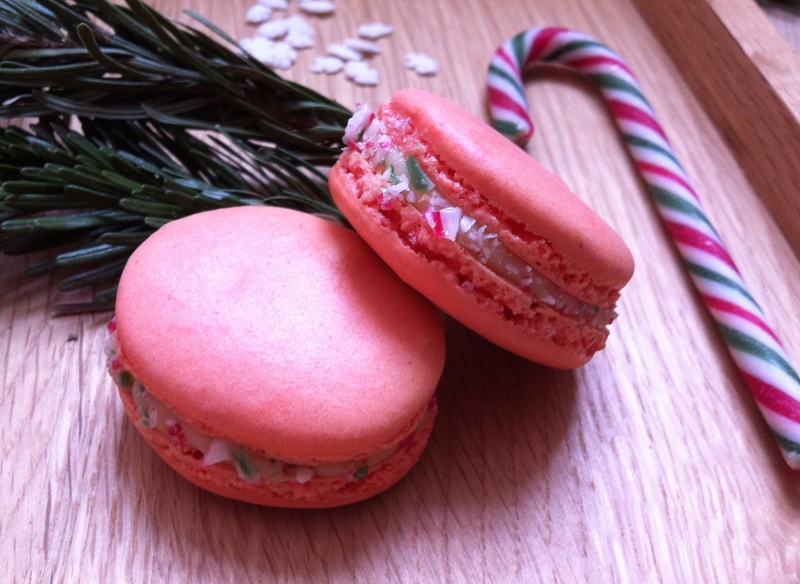 2012 is the year that I master macaroons, I’ll be referring to your posts to help guide me! Your macarons are gorgeous!!! Thank you for your macarons advice. I’ve been scared of making them after reading one too many blog posts of people who have had disasters. Macarons are definitely on my must make list this year, so thank you for linking to Brave Tart’s post. I’ve bookmarked it. Wow beautiful! Do you want to make me a batch? Just to let you know, I’ve nominated/awarded you the Versatile Blogger Award as one of my top 10 blogs here: http://freshlyseasoned.wordpress.com It’s a bit of a tag-team award, so if you want to join in, just read the post to see what to do next. thosecolours are stunning! i love that kitschy pink. not a fan of macaroons myself, and i’ve tried pierre herme’s so that’s saying something. but i always marvel at people who can make it. I know you say otherwise, but I believe it’s super tricky and finicky to make! Msihua – I love making them myself, but shop-bought ones can be so delicate and delicious. Choclette – we have so many chocolate coins in the house at the moment, I need someone to take some away! Mandy – thank you, hope the posts are helpful when you do get around to making some! Jennifer – thank you. And yes, Brave Tart’s posts on macarons are awesome. Sylvie – I had sanguinaccio in Bocca di Lupo in London, a pudding made with chocolate and pigs blood, which was actually very nice. You’d hardly know there was blood in it aside from a slight metallic aftertaste. Although I agree, it does sound a bit offputting! Lori – thanks, you should give them a go! These are so pretty and so festive! Macarons always seem intimidating to me, but the flavours here sound very tricky to resist! Lovely post and pictures as always. Thanks for the links. Zumbo’s croquembouche christmas tree looks amazing. Lucy – thank you. You shouldn’t be intimidated by macarons – they’re so much fun to make! Sadia – I know! That tree is incredible…the man is a genius. As a lover of lollies, sweets and candy and a good Zumbo challenge I love your macarons. They’re just perfect. I love the way you write and how beautiful your candy cane macs are. Yay for holidays and yay for the spirit you have created so beautifully. Orange, chocolate, garam masala, cinnamon, more chocolate, candy canes … thats what holidays are made up of. Leftover candy and kids are an impossible existence … maybe one day I shall get lucky. Until then I shall read your post again. Thanks for bringing the fun to Mactweets! Yum! If I had made any for Christmas I would have made ones just like these!